Those dogs have positive associations with the veterinarian’s office. In order to see me for training, my clients and their dogs have to come to the veterinarian’s office. Most of the dogs LOVE the veterinarian’s office. It is a “win, win, win” for everyone from the dog, the dog’s owner, the veterinarian technician’s, and the veterinarian. About seven years ago, I started having “puppy playtime” in my office. It is short, sweet, and all the dogs have been evaluated by me. The dogs love it! It isn’t so crazy that the dogs get overstimulated or hurt. I keep it positive. If a dog has had enough, I just let them have a nap in one of the kennels. I noticed that the dogs that come to playtime or my classes go crazy when they pull up to the front door of Lone Tree Veterinary Medical Center. They know there will be good times, treats, pets, and lots and lots of fun. Those dogs have positive associations with the veterinarian’s office. That type of association is priceless. It makes the dogs much easier to examine. There is almost no anxiety from those dogs when they come into the veterinarian’s office. There is also less anxiety from the owners. The dog’s owner is less nervous and therefore, so is their dog. When owners come in and tell a scared dog that “It’s OK”, it may reinforce some anxiety. If you don’t have the ability to train or bring your dog to playtime at your veterinarian’s office, you can still create positive associations by simply showing up at the veterinarian’s and making some great things happen. It is so much easier to examine and treat a calm relaxed dog. Ask your veterinarian if you can just stop by and have the vet techs or receptionists come over and give treats, pets, or some playtime. I have seen some very fearful dogs actually start to love the veterinarian’s office after just a few visits. Start by making arrangements to visit a few minutes a few times a week. Start this process when they are young if you can. If your dog is too scared to take treats from the vet techs or receptionists, just have them take the treats from you. If you are using food or treats, make sure it is something special, that they only get when they go to the veterinarian’s office. If you are using a toy, make sure it is a toy they only get to play with at the veterinarian’s office. 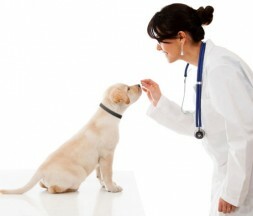 If your dog is trained to do anything, have them do it at the veterinarian’s office. They know that if they do the behaviors asked, there will be a reward. So ask your dog to sit down or do a trick for a treat.